A girl can never have enough shoes. Even if your kitchen cupboards have to become shoe closets, I say it’s all worth it. So imagine my delight to hear that French shoe boutique Sarenza is bringing their designer style over to the UK. A big fat ‘hurrah’ is in order. 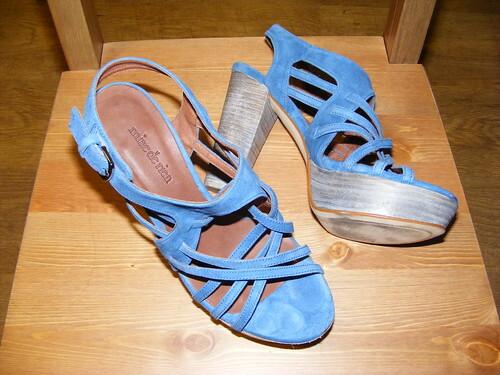 I scoured the continental fashion findings section of the site and settled on a fab pair of blue suede heels. When my shoes arrived to review there was something in my wardrobe that instantly sprung to mind. My special edition striped dress screams summer and matched my new shoes perfectly. These shoes by mine de rien are super comfortable with a soft suede upper and chunky wooden heel, my favourite kind as they won’t require re-heeling for ages if ever. I love the platform heel, the cross over design and comfortable sling-back straps. It’s also a nice touch that the wooden effect heel is grey rather than brown, it goes with a lot more of my wardrobe. Grey features there a lot. In fact, I intend to take them out partying this Saturday night… well, it would be rude not to give them a proper test run. Ask me again on Sunday morning how comfortable they are. These retail at £128 although offers can occasionally be found. The Sarenza website includes over 80 fashionable brands such as French brands Mellow Yellow and Maloles. I discovered some of these very brands when I went to Paris earlier this year with the Galleries Lafayette shoe floor, a woman’s heaven! I’m a little bit late to the fabulous competition that Sarenza set up to highlight their UK launch, but you can head over there and vote for all the other lovely blogging ladies who have donned their Sarenza shoes and the perfect outfit from their closet that complements them. Inspiring stuff. I chose Mine de Rien because the shoes were totally on-trend yet they had sneaky features that made them really easy to wear too – the odd wedge heel, or chunky stacked heel are a real relief for a fashionista’s feet. View contest and vote for your favourite blogger.